Every guest belongs to a group, even if they are the only member of the group, and each group has a single set of contact details. We therefore recommend that guests are grouped according to their address, e.g. by family or work-place. 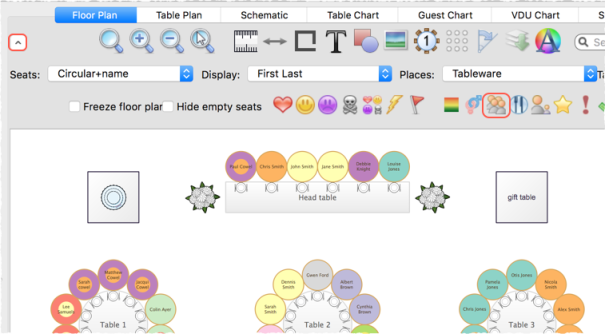 Whether guests should sit together is determined by the proximities set in the Proximity pane and not by group. 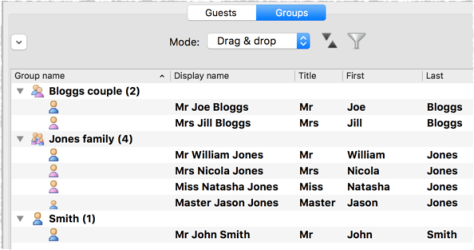 This gives you the flexibility to use the automatic assignment to separate members of a group (e.g. if you don't want to sit couples and work colleagues next to each other). However couples, families and groups are set to sit next to or near to each other by default. You can easily see where different members of a group are seated by clicking on the Groups button in the Floor Plan pane. Different groups are shown in different colour combinations. You can change the colours used in the Visualization colours window.